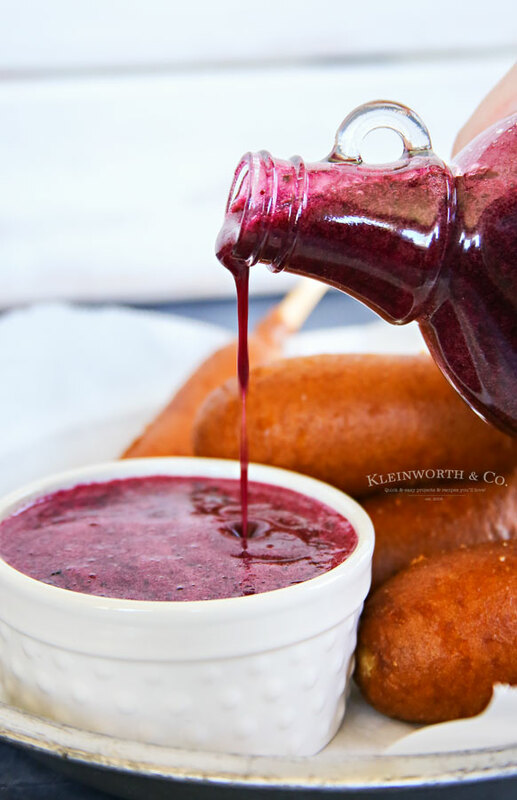 Homemade Blueberry Syrup is a quick & easy addition to breakfast. 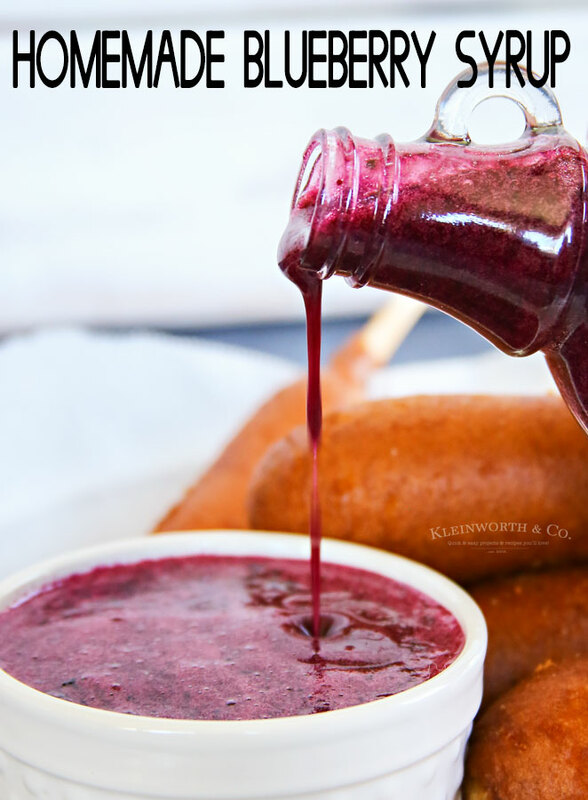 Just 3 ingredients & you have the perfect sauce for pancakes, waffles or even ice cream. It’s back to school time. Can you believe it? Seems those weekday mornings are so hectic, which makes it so hard to make sure everyone is full before the day really gets going. 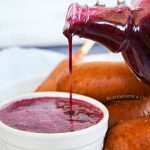 To keep simple breakfast options available for the kids & I like to whip up this quick & easy Homemade Blueberry Syrup to go with them. The mornings, they are crazy right? The older my kids get, the harder it is for me to make sure they are eating breakfast before rushing off to their school & work commitments. They are usually wrapping up the final details of term papers & getting in those last couple minutes of studying before an exam in the morning & typically forget about getting in a good breakfast. But breakfast is so important to make sure they are thinking clearly & performing at their highest level. 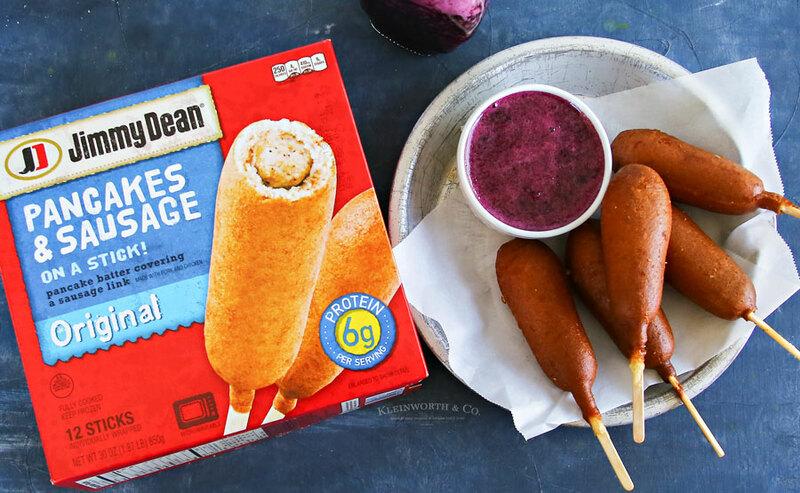 So in order to make sure they have something that is “grab-n-go” easy but still warm & filling, I like to keep a box of these Jimmy Dean® Pancake & Sausage On a Stick in the freezer for them. I like that they are made with pork and chicken & that they are microwaveable. That makes breakfast time super fast while delivering 6g of protein per serving. 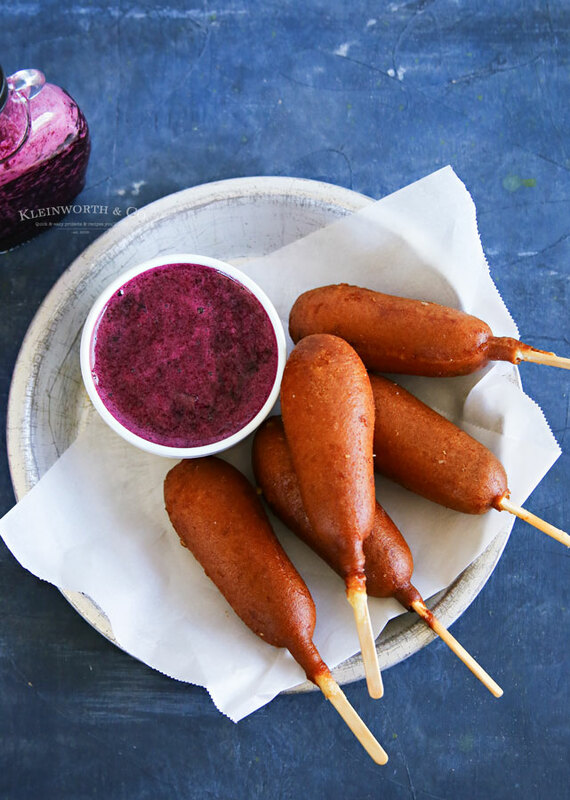 I mean, you just can’t go wrong with pancake batter covering a sausage link. 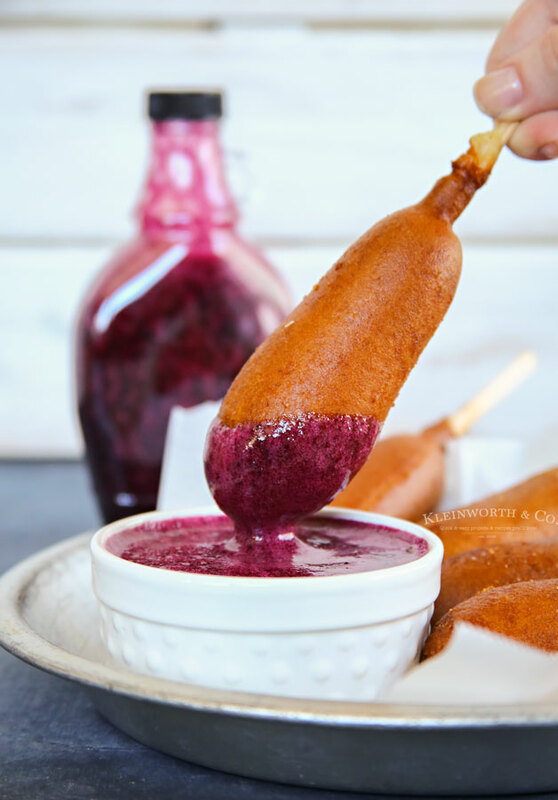 Unless of course, you dunk it in a little bit of Homemade Blueberry Syrup. 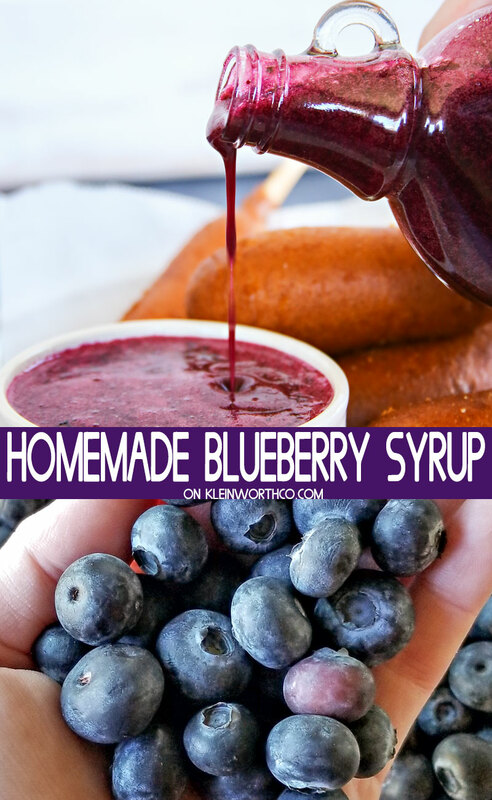 This Blueberry Syrup can be made in just a few minutes. Just place the blueberries, water & sugar in a medium saucepan. Bring to a boil over medium heat & then reduce to low and simmer for 10-12 minutes. Allow this to cool for about 10 minutes before transferring to a blender. You want to use caution when putting anything hot in a blender. I know it can be easy to get impatient, but it is really best to allow to cool to room temperature before this step. 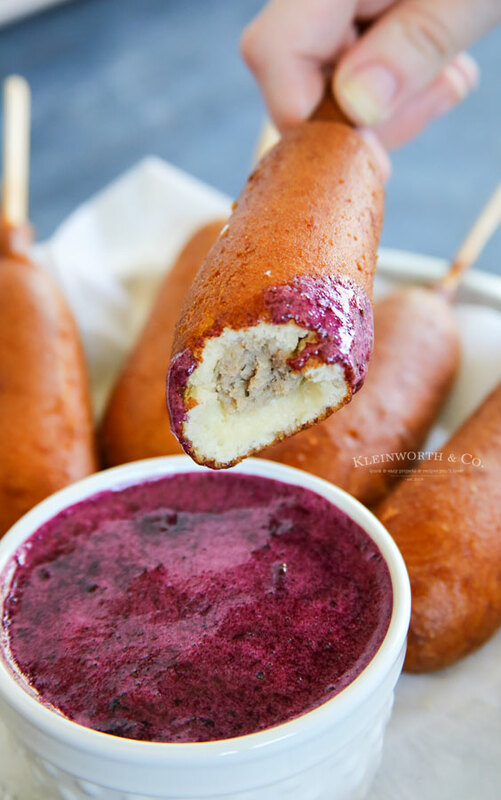 Where can I find Jimmy Dean Pancake & Sausage On a Stick? I like to pick it up at my local Walmart when doing my weekly shopping. Not only is it convenient but also helps me stick to my budget. Yes, you can. 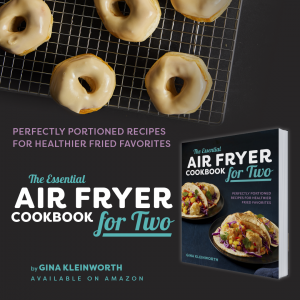 It doesn’t really matter if you use frozen or fresh. I like to have this syrup year-round, so I always have some frozen blueberries on hand for when we need them. But in the summer when my blueberry bush is producing buckets-full of berries, we make this with fresh & give it out to the neighbors. Can this recipe be made with other berries? Yes, you can do that as well. I would recommend reducing the berries by about 1/4 cup since most other berry varieties are larger than blueberries. Can I use artificial sweetener in place of sugar? I have not personally tried it. I would imagine if it were something that could be swapped 1:1 it would be fine. But the sugar does more than add sweetness to this syrup. The amount of liquid produced by that amount of sugar when heated is what gives the syrup it’s consistency. By changing the quantity or replacing it would change not only the taste but also the amount of liquid you would need to add & how long it would need to cook. Please keep these things in mind when altering this recipe. It’s a great way to kick start your day! YUM! *SPECIAL FOR THE KIDDOS* – if you visit the Teen Titans Go! website, there is a quiz to find out which character your child is, a special Teen Titans Go! frame for uploaded pictures, and more! Even better – check out my post on Instagram & post your own Tyson® product back to school meal using the UNIQUE HASHTAG #KleinworthCoEasyBreakfastsforBTS for my post and that enters you to win movie tickets. You can also find a great Shopkick offer here! **Don’t miss this Shopkick offer: shoppers can earn up to 400 kicks (100 per product – Tyson Chicken Nuggets or Strips, Hillshire Farm® Lunchmeats, State Fair® Corn Dogs, and Jimmy Dean Frozen Breakfast) that can be redeemed for gift cards or Fandango movie tickets. AWESOME! Add all ingredients to a 2 qt. saucepan & bring to a boil over med-high heat. Reduce heat & simmer about 10-12 minutes. Remove from heat & allow to cool to room temperature in pan. Once cool- transfer to blender & pulse until it's smooth & all the pieces of skin are undetectable. Transfer to airtight container & store in refrigerator. I like to heat for about 30 seconds in the microwave before using. Oh my goodness, that syrup looks absolutely scrumptious! It would be great on so many things. Thanks for sharing!